Lyons Rv Shower Pan-Hex 34" w/10" Apron Water Dam Parch. 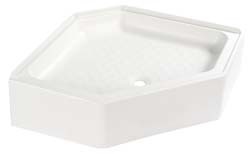 Lyons Rv Shower Pan -Hex 34" w/10" Apron, Water Dam, White. RV Shower Pans - Hex - Need to update or repair? "Hex"-shaped RV shower pans are beautiful and easy to install. Plumbing can be routed in between supports. A camper bathroom is normally fixed with a toilet, sink, tub and a shower. Under the soothing rush of water from an RV shower is what you will need to relax after a tough day behind the wheel. Lyons camper showers come in many styles and designs. Lightly textured surface to help prevent scuffs and scratches from everyday use. Made of acrylic capped fiberglass (ABS). Just bought this shower pan and it is great! very sturdy!